To increase interpersonal peacemaking skills. To enhance peaceful daily relationships by increased understanding of empathy, respectful communication, conflict resolution, cooperation and reconciliation. Problems can be solved peacefully. Working together toward a common goal is peaceful. I can make responsible choices. BLOCK TALK: Two children will sit on each side of a table. Both sides have the exact same blocks and one child will build something and tell the other child how to build it. Once they have both built they will check to see how well they communicated. They will then switch the process. This activity helps them to see how important it is to be clear in communicating their ideas or feelings. 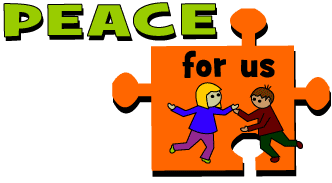 PATHS OF PEACE: In this activity children will work together to make a path for the ball to roll into peace. It may also roll into worry, fear, or hope. They will continue to work together until it rolls into peace. They will learn that working together they can accomplish many things and creating peace can be hard work, but is worth the effort.